These maps show the proposed growth of the tar sands, according to announced and officially proposed mega project components of the gigaproject. Updated from the original maps put out on OilSandsTruth.org two years ago, the following maps were produced with the Indigenous Environmental Network. 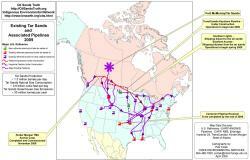 In the time since the last pipeline continental maps, one can see new proposed and expanded pipelines cutting this way and that across British Columbia, proposed to splice directly to California as well as reversing several lines to facilitate major tar sands super tanker traffic from Maine to Philadelphia and further along the Atlantic and into the Gulf of Mexico. 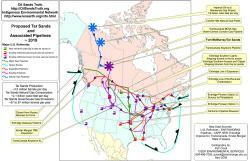 Wherever you are in North America there is probably a planned pipeline or refinery "just for you". 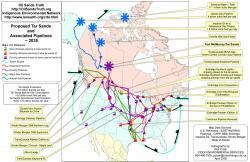 These maps do not include the dozens of refineries in Canada designed or planned to take tar sands mock oil; If the maps listed those it would be so busy as to be unreadable.